The 2011 Epcot International Food & Wine Festival at the Walt Disney World Resort is filled with well over a hundred different tastes to experience. Throughout the duration of the Festival, which runs through November 13th, we will be sharing with you some of the tastes that you can try for yourself along with our recommendations. The South Korea kiosk debuted at the Food & Wine Festival last year and it may contain one of the best bargains at the Festival. 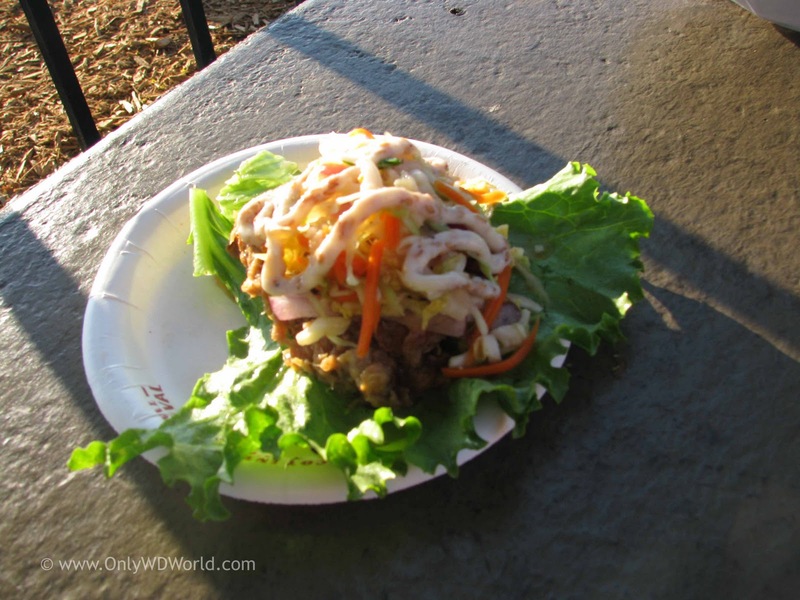 For just $3.00 you can get a fairly large portioned Lettuce Wrap With Roast Pork and Kimchi Slaw. This dish scores high points on many levels. Not only is the portion size large, but the dish is appealing to the eyes, as the presentation is well done. Of course the most important part is the taste. The Lettuce Wrap wins on this count as well. The combination of the different flavors and textures works well. For a dish that was not on our pre-festival list of "must try" foods, it definitely turned out to be one of our favorites and at a more than fair $3.00 price we liked it even more. 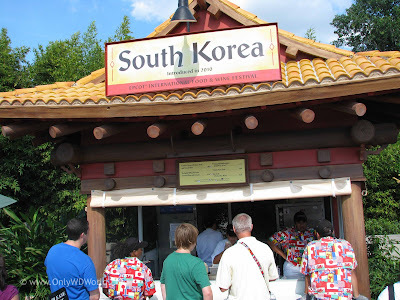 Definitely try the Lettuce Wrap With Roast Pork And Kimchi Slaw from the South Korea marketplace kiosk. This one goes near the top of our overall Recommended! List. 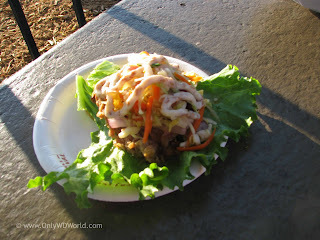 0 comments to "Taste Of Epcot Food & Wine Festival: Lettuce Wrap With Roast Pork and Kimchi Slaw"